The Year In Pop Charts: Return Of The Monoculture : Best Music Of 2012 Two things make for great years in pop music: variety and shared pleasure. After a handful of years when four-on-the-floor dance beats dominated radio, 2012 had both in spades. 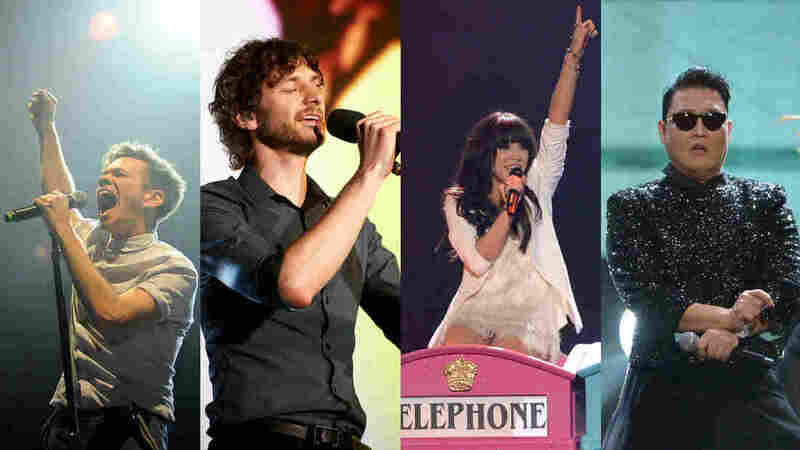 The stars of 2012, online and on air (from left): Nate Ruess of fun., Gotye, Carly Rae Jepsen and Psy. A left-field hit sung almost entirely in a foreign language, whose throbbing dance beat masked lyrics that were more political than one might suspect. A rock-pop crossover smash about holding onto youth into your thirties, even when your head is throbbing from self-reflection and encroaching decrepitude. A fluttery, buttery pop classic about a girl fretting over — yet exulting in — not knowing where that boy's head is at or where he thinks he's going. And the No. 1 record of the year — a rocker–ballad hybrid with egocentric yet self-lacerating lyrics, and an improbably catchy, minimal, skeletal sound. Quick, what year am I talking about? Why, 1984, of course — the year of Nena's "99 Luftballons (Red Balloons)," Bruce Springsteen's "Dancing in the Dark," Madonna's "Borderline" and Prince's "When Doves Cry." Widely agreed to be the greatest year for pop a generation ago, 1984 offered amazing variety on vinyl and represented a cultural peak for Top 40 radio. But of course, I'm also talking about 2012, the year of Psy's "Gangnam Style," fun. 's "We Are Young," Carly Rae Jepsen's "Call Me Maybe" and Gotye's "Somebody That I Used to Know." The last three of these songs were, according to Billboard magazine, the top three songs of the year. All four songs (especially Psy's) commanded our conversation largely via YouTube and iTunes, more than the radio, which caught onto them late. At the risk of offending pop classicists, I'd call 2012, if not quite the equal of 1984, a year in pop that aspired to that classic year's level of monocultural pleasure. The word monoculture is thrown around by culture critics nearly as much as by botanists. For us in the pop world, it means the idea of a shared cultural experience — The Beatles-and-Motown AM radio of the mid-'60s, or Michael Jackson's cross-cultural peak in 1983–84 — and for years, many of us have been mourning its passing. Dean of American Rock Critics Robert Christgau has been particularly vocal on the matter, decrying the loss of the monoculture as recently as a half-decade ago. Well, the monoculture is back — as impossible as that is to fathom, in an era of isolating earbuds and a myriad of entertainment channels. Two things, I'd argue, produce good years for pop music: variety and shared pleasure. That's what made 1984 great, and it's what made 2012, however imperfect, so pleasurable so much of the time. First, variety: 2012 finally saw the Gaga-era, all-dance-all-the-time fever that's commanded pop radio since the start of the Obama Administration start to break. You saw it atop Billboard's iconic, half-century-old Hot 100, a chart that combines song sales, radio airplay and, as of this year, online streaming data like Spotify. Just look at Billboard's aforementioned Top Three of 2012. It ranges from Gotye's Sting- and Peter Gabriel–inspired, remarkably quiet lament, sporting a prominent xylophone hook; to Jepsen's smash, whose beat was certainly danceable but on the whole was sonically closer to the pure pop of the late '90s; to fun. 's soaring pop-rock, which creatively reimagined the delirious sonic fantasias of Queen. As good as this trio is, it's too soon to declare victory over the pop radio's historic tendency toward monotony. The rest of Billboard's Top 10 songs of 2012 include such oontz-oontz anthems as "Lights" by Ellie Goulding (No. 5 for the year), "We Found Love" by Rihanna (No. 8) and "Starships" by Nicki Minaj (No. 9). (All three, I'd argue, are better than the average dance jam — in Goulding's case, way better — but still.) And while it was heartwarming to see boy-band pop make a comeback in 2012 via U.K. imports One Direction and The Wanted, neither band has yet recorded anything as culturally resonant as Backstreet Boys' "I Want It That Way" or as sharp as *N Sync's "Girlfriend." Though it must be said that 1D's "What Makes You Beautiful" (No. 10) was one of the year's better-crafted pop commodities and remarkably good for a debut single. The point is, in 2012, you began to see the dam breaking: While 2011 could fairly be described as "dance divas plus Adele," in 2012 the British siren wasn't alone in providing a richer stew of pop sounds. And when we, the lowly pop fans, found a song we liked, we championed it before the industry gatekeepers were ready for it. On YouTube, Spotify, Twitter, amongst ourselves, we shared, and shared, and shared. Talk about shared hits — Billboard's Top Three songs of the year commanded the Hot 100, not just for a week or two, but for at least a couple of months each. Gotye's hit was No. 1 for eight weeks, Jepsen's for nine and fun. 's for a comparatively modest six. These snowball smashes didn't just control the radio airwaves the way most pop hits do. At their respective peaks, each seemed to own U.S. culture. The fun. single broke wide thanks to a Superbowl ad by Chevrolet last February that directly followed a performance on Glee. By the time "We Are Young" topped the Hot 100, it was selling a staggering 300,000 downloads a week (huge in the dead of winter), was the first No. 1 single boosted by Spotify streaming, and was also the first rock-crossover No. 1 hit since Coldplay four years earlier (really, arguably, since Nickelback a decade earlier). The Gotye single was also an unlikely crossover from rock radio. But even before "Somebody" materialized on the charts in the spring, its simple, arresting video had already been viewed on YouTube more than 100 million times (it's now above 350 million). The week it topped the Hot 100, Gotye's song sold a mind-blowing half-million downloads, was on Saturday Night Live as well as Glee (yes, them again) and began spawning a raft of inspired YouTube covers. Two months later, when Gotye succumbed to Jepsen's 2012 Song of Summer "Call Me Maybe," we were in a full-on Carly Rae national moment. Everyone from pop demigods to Olympians to veteran Muppets uploaded a lip-dub or a cover of the genius pop trifle to YouTube. Speaking of YouTube, I would be remiss if I did not address the global phenomenon that was "Gangnam Style," which just surpassed a record one billion video views worldwide. In America, Psy became an accidental ambassador to K-Pop, the candy-colored regional music long predicted to break here. His subtly subversive ditty ultimately peaked at No. 2 on the Hot 100, selling more than three million downloads. According to Billboard, "Gangnam" only ranks No. 47 for the year — but with all of America watching his video and imitating his horsey-dance, Psy is likely shrugging off that detail. The result of all these viral smashes is a shared pool of hit songs that's bigger, more omnipresent, more culturally dominant than we've seen since the '80s. Remember the radio station that was only targeting 25-to-35-year-old guys, or 12-to-29-year-old females? At radio, after a two-decade plunge into "narrowcasting," scores of stations have switched back to the Top 40 format in the last couple of years. As of the end of 2012, some 300 stations in the United States — the largest number in a generation — report to Billboard magazine as some form of Top 40 music. (Some lean "rhythmic" or "adult," but 157 of them — more than half — play what the magazine terms "mainstream" Top 40.) Sure, they still want young listeners, as all advertisers do; but their idea of broadcasting is broader than we've seen in a long while. Radio is still a powerful medium, capable of making hits. Witness the big single of the fall, Maroon 5's faux-reggae Ace of Base homage "One More Night" (No. 18 for the year). A dream hit for radio, its midtempo beat suitable for midday drive-time airplay and nighttime dance-mix shows, "Night" never ranked as the best-selling song in the country. But wall-to-wall radio airplay kept it atop the Hot 100 for nine weeks. But the Maroon 5 hit was the exception, not the rule, for hit records in 2012. For much of the year, radio found itself following, not leading, the pop parade. Since 2005, when iTunes and other digital song sales were added to the Hot 100 formula and began to change the sound of pop, radio program directors have been playing closer attention to digital phenomena. They're keeping an eye on, and playing catchup with, fast-moving consumers. Now, with streaming audio like Spotify also baked into the charts, listeners have even easier ways to infect friends with their favorite songs. Programmers are being pulled toward left-of-center records like "Somebody That I Used to Know" and "Gangnam Style" by rank-and-file listeners — instead of radio pushing listeners, as it did for decades. We'll know the move toward all-encompassing pop has succeeded if, by 2013 or 2014, R&B and hip-hop are in the mix, too. Unfortunately, after dominating the charts a decade ago, black music in all its forms has been a casualty of the 2010s' return to pop centrism. Within Billboard's year-end Top 10, black artists either have supporting roles on hits by pop/rock acts (Janelle Monáe on fun. 's "We Are Young," Wiz Khalifa on Maroon 5's "Payphone") or are scoring dance-pop crossover hits that received little urban radio airplay (neither Rihanna's "We Found Love" nor Minaj's "Starships" — pop smashes, both — even made the R&B/Hip-Hop chart's Top 40). You have to go down to No. 20 on Billboard's year-end tally to find a genuine black-radio hit: Drake's "The Motto," featuring Lil Wayne, a No. 1 R&B/Hip-Hop hit that also reached No. 14 on the Hot 100. This is a shame, because artistically, R&B and hip-hop had a stellar year, as shown by the dominance by Frank Ocean, Miguel and Kendrick Lamar on critics' year-end lists. It's hard to call 2012 a true equal to 1984 when we don't have a Michael Jackson or a Prince — or even a Chaka Khan or a Billy Ocean — going toe-to-toe with pure pop on the charts. If you're an omnivorous pop fan, millennial pop still has a ways to go to satisfy you. There are signs that our expanding definition of pop will persist into 2013. As we head toward New Year's Eve, the Hot 100 is topped by Bruno Mars's genre-blind "Locked Out of Heaven" — like Gotye's smash, it's a pop-rock song indebted to the sound of vintage Sting. (What was it with that guy this year?) Mars sits on top of a Top 40 containing The Lumineers' stompy-Americana hit "Ho Hey"; the Grammy-nominated acoustic ballad "The A Team" by Ed Sheeran; Kendrick Lamar's pleasantly loopy hip-hop hit "Swimming Pools (Drank)"; and Miguel's magnificent reimagining of vintage Marvin Gaye with "Adorn." Whether we're still talking about any of these records 12 months from now, or a hit even more left-field than Psy's, will determine whether our just-completed Year of the Adventurous Pop Debutante was a fluke. Maybe 2012 will turn out to be the warm up to an even more adventurous 2013. Or maybe we'll keep veering back to four-on-the-floor club hits again. Either way, at least we, the members of the reinvigorated monoculture, will be listening to and YouTubing them together.